So I know that it’s not the easiest habit for most people, and most people’s experiences consist of starting and stopping and starting again. Which is fine — don’t beat yourself up about it. The important thing is starting again. Today I thought I’d visit the topic for those who have trouble. Too difficult. People set out with a lot of ambition and enthusiasm, and start out with a big goal. “I’m going to go to the gym for an hour a day!” or “I’m going to run 30 minutes every day!” The problem is that the goal is too difficult to sustain for very long. You can do it for a few days, but you soon run out of energy, and it becomes a drag to do it. Too many goals. Often we set out to do too much. We want to run, and lift weights, and eat healthy, and quit sweets, and stop drinking soda. Well, those are multiple goals, and you cannot focus on the exercise habit if you’re trying to do all the others at the same time. Or we might start with one goal, but then get caught up in another goal (to stop procrastinating, for example), and lose our focus on the first one. Not enough motivation. It’s not a lack of discipline, it’s a lack of motivation. The most powerful motivators, in my experience, are logging your habit and public pressure. There are many others that help as well. So how do we solve those problems? Keep it simple. Here are the 4 simple steps to start the exercise habit (and keep it going). I should note that you can use these 4 steps to start any habit. Written: Write this down. Post it up. If you don’t write it down, it’s not important. Easy: Don’t — DO NOT — set a difficult goal. Set one that is super, super easy. Five minutes of exercise a day. You can do that. Work your way to 10 minutes after a month. Then go to 15 after 2 months. You can see what I mean: make it easy to start with, so you can build your habit, then gradually increase. Specific: By specific, I mean what activity are you going to do, at what time of day, and where? Don’t just say “exercise” or “I’m going to walk”. You have to set a time and place. Make it an appointment you can’t miss. Trigger: I recommend that you have a “trigger” right before you do your habit. For example, you might always brush your teeth right after you shower. The shower is the trigger for brushing your teeth, and because of that, you never forget to brush your teeth. Well, what will you do right before you exercise? Is it right after you wake up? Right after your coffee? Right when you get home? As soon as you take off for lunch? A trigger that you do every single day is important. Measurable: By measurable, I mean that you should be able to say, definitely, whether you hit or miss your goal today. Examples: run for 10 minutes. Walk 1/2 a mile. Do 3 sets of 5 pushups. Each of those has a number that you can shoot for. One goal: Stick to this one goal for at least a month. Two months if you can bear it. Don’t start up a second goal during that 30-day period. If you do, you are scrapping this goal. 2. Log it daily. This is the key habit. If you can log your workout, you will start to see your progress, and it will motivate you to keep going. And you have to make it a habit to log it right away. Don’t put it off, and say you’ll do it before you go to bed. As soon as you’re done working out, log it. No exceptions. And don’t make the log complicated — that will only make you resist doing the log. Just the date, time, and what you did. 3. Report to others. I think this is key. You can do it on your blog, on an online forum, with your spouse, or friends or family, or a workout partner, or a coach, or a group, or a class. However you set it up, make it part of the process that you have to report your daily workout to other people. It could be using an online log, or on a forum, or through email, or the phone, or just by telling your co-workers what you did this morning. But be sure that they know your goal, and that you are going to report to them, and be sure that they are expecting it every day. 4. Add motivation as needed. The first three steps might be enough for you to get the habit going. But if not, don’t just give up. If you miss two consecutive workouts, you need to look at why, and add a new motivation. Rewards, more public pressure, inspiration, whatever it takes. Read this article for more on this. You can add one additional motivator, and then see if it works. If you miss two more consecutive workouts at any time, add another motivator. And so on, until the exercise habit sticks. In our previous article we have told you some good warm up exercises covering almost all major body parts using frequently. for example if you perform 100 reps of situps as your major workout your warmup is to be of 20 reps of situp. warm up is basically preparing your body for what to come so it is less damaged. Mostly weight loss routines involve that belly block which you want to reduce. Abdominal muscles are strongest and require very advanced workout. Abdominal muscles are also very sensitive and require care as they are link with your back. So to prevent injuries and damage warm up for abs are essential. Below are some warm up exercisesbefore your situps. There are no specific exercise for warming up your abs. I before starting my actual abs routine I start with stretch as mention earlier, 20 minutes cardio routine, lunges and jumping jacks. My work out routine mainly consists of abs exercises. Above mentioned warm up increase my heart rate and I am sweating severely. After that as my warm up of abdominal muscles I perform 50 sit up. So mainly your abdominal warm up is preparation of your actual work out routine. Exercise consisting of your warmup routine done in small reps would be well consider as your warm up. Lie straight on your back, lying face up on the floor with knees bent and feet flat. Feel free to tuck your feet under a fixed object if you feel the need, but only if you don’t suffer from lower back pain. The movement begins by curling the shoulders towards the pelvis, with hands gently placed behind or below the ears. Try to keep your eyes on the ceiling even when you curl forward. Avoid placing the hands behind the head itself as using them to exert force on the neck can cause injury. Good practice is for the hands to lightly support the weight of the head, so that the neck flexor muscles can relax during the movement. Do not jerk the head forward with your hands. Slowly contract your abdominals and come up to an angle of no more than 35 degrees – there’s no need to go further than this – and exhale as you crunch forward. It’s important to focus on working the abdominal muscles and not the hips and also to keep your chin off your chest. The lower back should not leave the floor which will make the curl up an effective isolation exercise for the abdominals. Start with 10 reps and after 2 days increase 1. Once you’ve reached the 35 degree position, hold for one or two seconds before gently lowering yourself to the floor. Inhale on the way down and repeat. Focus on natural, rhythmic breathing as you continue to perform the exercise. Stand with feet shoulder-width apart, knees slightly bent, and abdominal muscles drawn in. With arms straight at your sides and palms facing in toward thighs, hold a 1 to 2-pound dumbbell in each hand. Contract your bicep to bring the right dumbbell up, rotating a quarter turn so your palm is level with and facing your right shoulder. Pause, then slowly lower to starting position; repeat with left dumbbell. Do 3 sets of 15 reps on each side. Stand with left foot forward, knees bent. Bend slightly forward at the hips and keep abdominal muscles pulled in toward the spine. 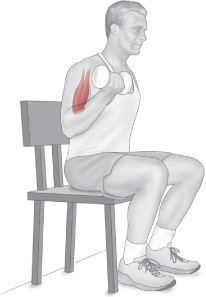 Place left hand on left thigh for support and hold a 1/2 to 1 pound dumbbell in your right hand. Keeping elbow bent, pull right upper arm up and back to almost parallel with the ground. Extend arm straight out behind you. Squeeze and hold before bringing arm back in to starting position. Do 3 sets of 15 reps on each side. Stand up straight with feet shoulder-width apart, knees slightly bent, and abdominal muscles pulled in. Hold a 1 to 2pound dumbbell in each hand at shoulder height with palms facing forward and elbows pointed down. Press dumbbells directly up over shoulders in line with the body so the weights just touch over your head; keep neck long and shoulders down. Slowly lower dumbbells back to starting position. Do 3 sets of 15 reps. 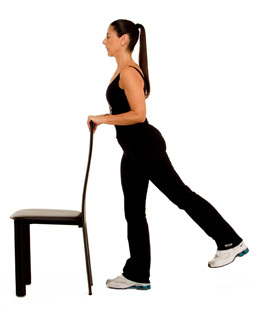 Stand with right foot forward, knees bent, and weight evenly distributed on both legs. Hold a 1 to 3 pound dumbbell in your left hand and place right hand on right thigh for support. Bend forward slightly at hips and keep abdominal muscles pulled in toward the spine. Begin with left arm straight, then exhale and bring left elbow straight up, close to the body, until the dumbbell is next to the bottom of your rib cage. Pause, then slowly return to starting position. Do 3 sets of 15 reps on each side. Lie down on your back with one leg bent and one leg straight. Next, perform a posterior pelvic tilt to protect your back from injury. To do this, draw your umbilicus (belly button) toward the floor. If you are doing this correctly, your back should be flat against the floor/mat. You can also check your technique by putting your hand under the small of your back, on the floor, and flatten your back so that your back is “crushing” your hand. With your toes pointed to the ceiling, keep your knee straight and lift your leg up to about 45 degrees. It shouldn’t be raised higher than the bent knee. Slowly lower your leg back to the floor. Repeat 10-15 times, 3 times in a row. Repeat with opposite leg. Stand with your legs shoulder width apart. Hold onto a stable chair or table for support. Perform an abdominal draw in to protect your back from injury. Do this by pulling your umbilicus (belly button) in towards your back. Keep your knee straight, toes pointed and kick your leg forward in a slow and controlled motion. Return to the starting position. Repeat 10-15 times, 3 times in a row. Repeat with opposite leg. Stand with your legs shoulder width apart and hold onto a table or chair in front of you for support. Perform an abdominal draw in to protect your back. Do this by pulling your umbilicus (belly button) in towards your back. Keep your knee straight and toes pointed, and kick your leg backward slowly. Make sure you keep your upper body and back straight during the exercise. Return to the starting position. Repeat 10-15 times, 3 times in a row. Repeat with opposite leg. Stand with your legs shoulder width apart and have a table or chair next to you for stability. Perform an abdominal draw in to protect your back from injury. Do this by pulling your umbilicus (belly button) in towards your back. Keep your knee straight, toes pointed and kick your leg out to the side of your body slowly. Make sure you keep your upper body and back straight during the exercise. Return to starting position. Repeat 10-15 times, 3 times in a row. Repeat with opposite leg. This is one of easiest warm up exercise, which you can perform in gym or in home if you plan your workout there. Take a wooden block of 1 ½ – 2 foot. Stand straight, with your chest forward. Take a step on block with your right foot. Then step down with same foot. Repeat it 10 times. Now repeat procedure with left foot. By taking each steps also move your hands and arm as you move them in march parade, this would warm up your shoulder muscles. If moving your arms are difficult, then place them on your hips. If you don’t have a wooden block you can perform this workout on stairs. This exercise covers your thigh, glutes and hip muscles. You can increase intensity of this exercise by increasing wooden block size or taking two stairs at times.